Fresh skimmed milk, enriched with protein. Filtered, standardised, homogenised and pasteurised. Fat free milk. Full of taste. 100% British milk. Farmer owned - care in every step, from cow to you. Suitable for vegetarians. Skimmed milk that tastes as good as semi-skimmed* *Based on statistically valid comparative taste test results with 208 regular consumers of fresh semi-skimmed milk. Arla B.O.B gives you the best of both worlds. 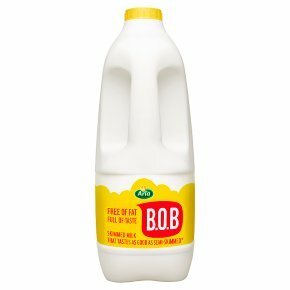 A fat free skimmed milk that's as tasty as semi-skimmed, so you can glug, pour, splash, or dash it to your heart's content.